Our risk warning, "Capital at risk"
This is for compliance purposes. Refer a friend to Sporting Index and you'll earn yourself £100 cash once they open an account with us and place at least three settled bets - £5 minimum stake able and the bet must have the potential to win and lose £20 (see Ts&Cs below). 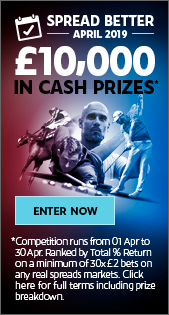 When their qualifying bets have settled, please call our Customer Services team on 08000 96 96 07 to claim your £100. 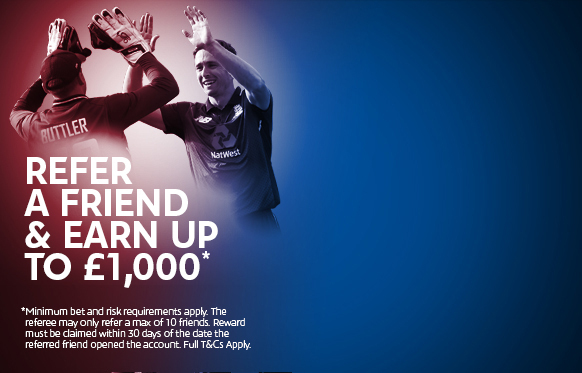 You can refer a maximum of 10 friends, meaning you can earn up to £1,000. So refer your friends today, get your bets on and enjoy the thrill of sports spread betting together. 1. You agree that by participating in this Refer and Earn offer ("Offer"), you will be bound by these terms and conditions ("Terms") as well as the general rules that apply to your account ("Account Operating Rules"). You should read these Terms and the Account Operating Rules. 2. To be eligible for this offer you must, in the past 30 days, have placed a minimum of 5 bets, each with the potential to win and lose £20, independently of any other promotional offer. Bets previously placed for the purposes of referring a friend will be deemed to be part of another promotional offer and will not qualify. 3. Introduce a friend to Sporting Index and once they have opened an account with us (credit and suitability checks apply) and placed at least three bets (independent of any other promotional offer), each with a minimum stake of £5 that has the potential to win and lose at least £20 (examples shown below), you can claim your £100 cash. i) A £5 stake on a pre-match `buy' of Total Goals at 2.5 has the potential to win £20 or more but does not have the potential to lose £20 as the maximum loss of this bet is £12.50. This bet would not qualify. ii) A £5 stake on a pre-match `buy' of Total Goals at 4.0 has the potential to win £20 or more and also has the potential to lose £20 as the maximum loss of this bet is £20. This bet would qualify. 4. Only settled bets will be considered for the purposes of this Offer. Unless otherwise stated, fully, partially, or reverse closed bets will not count as qualifying bets under this Offer. 5. Only bets placed on real spread betting markets will be considered for the purposes of this Offer. Bets on virtual games will not be considered. 6. To be deemed the `referrer' for the purpose of this offer, your friend must have included either your name or account number in their account application. 7. This Offer cannot be used in conjunction with any other offer. 8. The introducer may only refer a maximum of 10 friends for this Offer. 9. Only one Promotion is allowed per Sporting Index customer, per household, per address, per shared computer and/or per shared IP address. 10. Cash must be claimed by calling our Customer Services Team on 08000 96 96 07, within 30 days of the date the referred friend opened the account. The cash has no rollover requirements associated with it. 11. By referring a friend, both you and the referred friend agree to data regarding your betting activity being disclosed by Sporting Index to each other as appropriate, for the purpose of this Offer only. You must notify any referred friend that data will be shared in this way before you submit their details for the purpose of this Offer. 12. We reserve the right to exercise our sole discretion as to whether or not to open account facilities for any prospective client. 13. 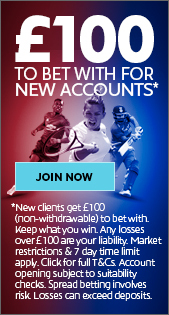 No employee (or any relation or partner or agent thereof) of any spread betting or fixed-odds bookmaking firm is eligible to take advantage of this Offer. 14. We reserve the right to cancel or amend the Offer or any part of it at any time and without notice if we have reasonable grounds to believe that:(a) there has been any co-operation, collusion and/or organisation of Bets from the same source; or (b) the account is being used for the benefit of a person other than the account holder in contravention of our Account Operating Rules; or (c) there has been fraudulent or illegal activity in relation to the Promotion (including participation that would be in breach of the law in your local jurisdiction). 15. If the Promotion cannot be executed as planned, including due to any unforeseen issue or technical malfunction beyond our reasonable control, we shall incur no liability. 16. If any term within these Terms is found to be illegal, invalid or unenforceable under any applicable law, such term shall, insofar as it is severable from the remaining parts, be deemed omitted from these Terms and shall in no way affect the legality, validity or enforceability of the remaining terms. 17. These Terms shall be governed by the laws of England and Wales. Any dispute or claim arising in connection with these Terms or their formation (including non-contractual disputes or claims) will be subject to the non-exclusive jurisdiction of the courts of England and Wales. If you are resident in another member state of the European Union, you may choose the courts of the member state of the European Union in which you are resident. If you are a resident of Northern Ireland, you may also bring proceedings in Northern Ireland, and if you are a resident of Scotland, you may also bring proceedings in Scotland.